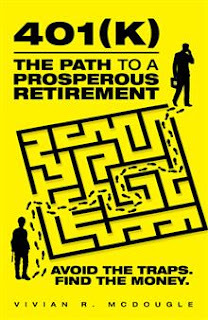 Dog Eared Publicity is pleased to bring you Vivian R. McDougle's 401(k) THE PATH TO A PROSPEROUS RETIREMENT Book Blast January 2 – 13! 401(k)-The Path to a Prosperous Retirement: Avoid the Traps. Find the Money. presents the fundamental information that will help individuals understand the various types of retirement accounts that take their category name-the 401(k)-from the Internal Revenue Service provision that authorizes them. Widely used by people who desire to prepare for their retirement years, the 401(k) can become, as the title suggests, "the path to a prosperous retirement." In this plainly worded guide, Vivian R. McDougle covers the topics one needs to understand both to "avoid the traps" and to "find the money." 401(k)-The Path to a Prosperous Retirement covers subjects like the workings of the stock market, the characteristics of a 401(k) account, the types of retirement accounts, the management of job changes, the workable retirement plan, and the best arrangements for getting the most out of one's accounts. If you know that you plan to retire, but have felt intimidated by the prospects of setting up a 401(k) and beginning a savings plan, then 401(k)-The Path to a Prosperous Retirement will give you just the right level of detail to get you started on the path to a retirement in which you have the funds to do what you plan for those years after your work is ended. Vivian R. McDougle is a retired mother of three children. Her professional background includes experience working in accounting as a mutual funds representative. Vivian is giving away a $25 Gift Card!